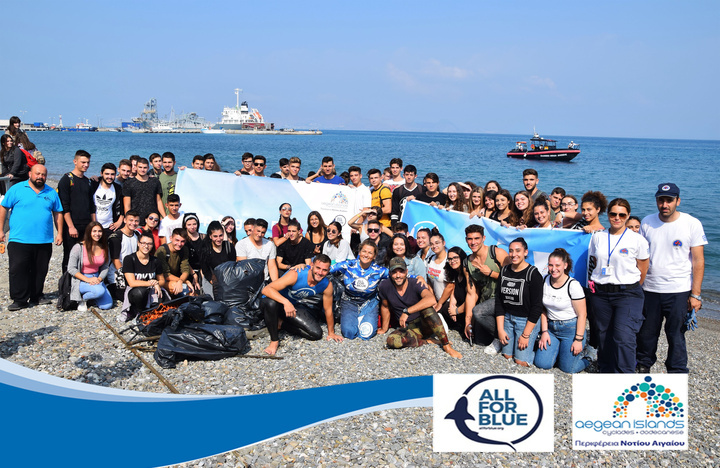 With the great participation of students and citizens, the Keep Aegean Blue environmental action continues in the southern Aegean islands, in collaboration with the Organisation All For Blue, by Katerina Topouzoglou and the Region of South Aegean. After Paros, Leros, Kalymnos, Rhodes, Symi, Tilos, Santorini and Milos, the biggest beach & underwater cleanups mission in Greece, with the team crossing the Aegean with a motor boat and hundreds of nautical miles, continued on the island of Naxos with impressive results since the “harvest” exceeded half a ton of trash! Among others, a pump, a motor, a cistern, wheels, stylizers, coolers, nets, cups, ropes, pipes, bags, bottles and other objects managed to get off the shore and bottom of Agia Anna beach in Naxos, General and Professional Lyceum, professional divers from the local diving centers and All For Blue, independent volunteers from Naxos Plastic Free and representatives of the Coast Guard, who participated in the campaign, while the garbage circulated a truck of the Municipality of Naxos. The enviromental action was also attended by the former model and tv hostess Katerina Kanonidou. Before the action, in a packed room of the “Gorgona” restaurant, with the presence of the South Aegean Regional Governor, George Hatzimarkos, a seminar was held which was attended by students on the importance of protecting the marine environment. Katerina Topouzoglou and her team are crossing with a motor boat hundreds of nautical miles to meet the students of participating schools in the islands and all those who are environmentally aware and expect to contribute to the effort for clean shores and seas. The program of actions of this initiative continues with subsequent stations, Andros (16/4), Tinos (17/4) and Mykonos (18/4), while Karpathos will be the last stop on 8 May. The aim of the campaign is to protect the marine environment from pollution, along with the awareness and activation of young children, the guarantors of a future of sustainable development for the South Aegean.